What we learned from the "Infectiously Expanding the Universe of Tom Clancy's The Division 2" panel held at San Diego Comic-Con 2018. Tom Clancy's The Division 2 made an appearance at Comic-Con with a panel titled 'Infectiously Expanding the Universe of Tom Clancy's The Division 2' which featured creative director Julian Gerighty and other members of the development team. The focus of the panel was on the story of The Division, how it would be continued in The Division 2, and what it takes to create a world-building narrative. The Division explored what would happen if a virus was released in a major city like New York and showed that the danger came more from the chaos that would ensue from that event as from the virus itself. Unfortunately, the virus was not contained to New York and spread across the country leading to a collapse of the government. The Division 2 is set seven months after that collapse, and your goal is to try to control the chaos and help bring about the rebirth of the nation. 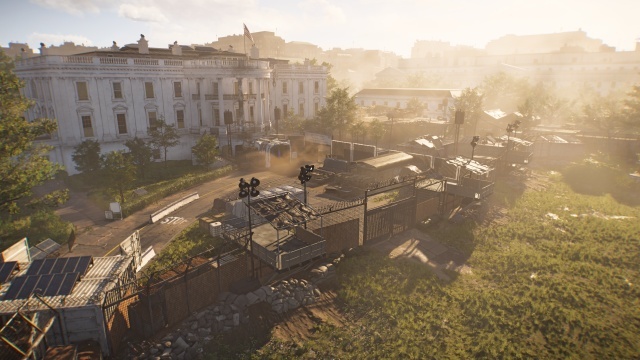 The Division 2 is set in Washington, DC, and to prepare for the game the development team spent a lot of time in the city. They took a large number of photos to capture the look of the city and its iconic locations, and even created a book about the city that was only used internally by the development team. They did more than just take photos, though. They took part in activities that would help them to appreciate what it would be like once civilization started to break down. For example, they hunted deer near Washington, butchered their kills, and then distributed the meat to homeless shelters in the area. The result of all of this on-location work is a recreation of Washington that has been transformed by disaster, but one that is still recognizable. In fact, if you're familiar with the city, you'll be able to find your way around the Washington in The Division 2. Part of the process in transforming the city is visiting some of its iconic locations and trying to determine what would happen to those locations, and exploring how it would change and how it would be used. Rather than give anything away from The Division 2, the example the panel gave was New York's Madison Square Garden from The Division. They saw that a sports arena would make for a good location for an aid distribution center. However, a distribution center would concentrate a lot of resources into a small area, making it a big target for rogue factions. The team applied the same thought exercises to the locations in Washington, but also took into account the fact that Washington is a different city than New York. The people of Washington would react to disaster differently than those in New York, and this gave the team the opportunity to tell some stories that they couldn't in The Division. The panel then discussed the opportunity that other media provides them to tell more of the story than they can convey in the game. While they try to use devices within the game such as the echoes to expand the story, the story is still localized to the game's location in Washington. A novel based on The Division will help tell the story well beyond the urban East Coast corridor from New York to Washington and let fans of the game learn what has become the new normal for other parts of the country after the disaster. Ubisoft is also partnering with Dark Horse to produce a graphic book based on The Division that the panel described as a 'Smithsonian Museum exhibit set in the world of The Division.' You'll learn more about the characters in the game as well as details on their world such as how a Division agent packs their go bag. The books are designed to help maximize the experience of the narrative. You'll learn new details about the world, the motivations of the game's characters, and see new aspects of the game's world brought to life. And the books are designed to overlap and intertwine with the game, so those who read the books will also find references to things from those books within the game. An impressive amount of work is going into creating The Division 2's world that goes well beyond the main storyline. You'll benefit from this work just by playing through the game, but there's a lot more available both within the game and its supporting books that will help you experience the whole world of The Division.